Easy Container let's site administrators quickly create containers on the fly using web based UI, significantly improving productivity. Each container can be customized for position, appearance, actions and so much more. 1 Year of FREE Updates and Support! Then, renew every year for 50%! Easy Container behave pretty much as standard DotNetNuke containers except they provide a link to open a popup dialog where Easy Container does its magic. 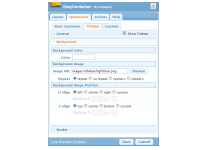 Everything about Easy Containers is stored in files in DNN containers folders, so they can also be modified manually. So we designed Easy Container to not hold an exclusive interface on the container, making it possible to create containers manually or through automated scripts. The Container Builder opens in a popup and every change you make is applied instantly on the page for previewing purposes. Hitting Cancel at any time will drop all the changes. It's not until you hit Save that the settings are saved on disk. 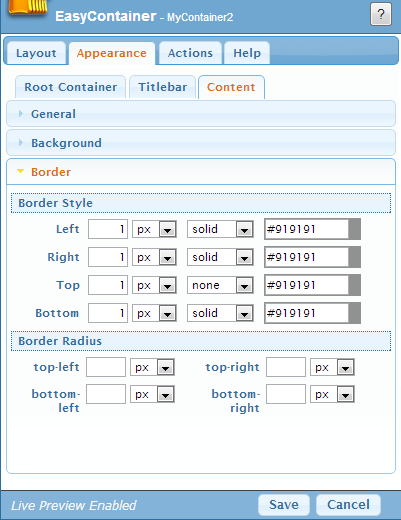 Easy Containers features various options for tweaking sizes, layout, fonts, borders, backgrounds and more. These settings are displayed in tabbed popup interface for quick administration. Make sure to check the Live Demo for a taste of productivity! Take advantage of our free personal DNN consultation service! Please consider the upgrade of all DNN Sharp products to version 5.0 to avoid any unforeseen conflicts. Can't find the feature you need? Place a feature request on our forums. 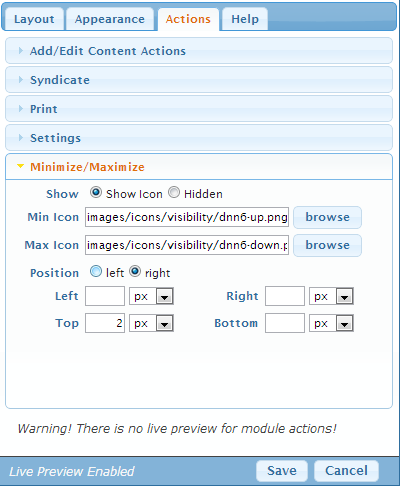 Each module that uses an Easy Container has a link that opens up inline popup with settings to adjust the container. 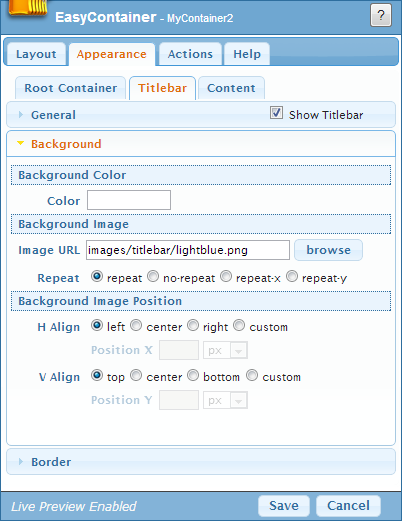 Changing container settings is reflected real time on the page but are not actually visible to any other user until you click save. Once with version 2.0 Easy Container comes with built-in responsive capabilities so all you have to do is define which module is visible on what devices. Container Builders opens in popups, more can be open at the same time making it very easy to transfer settings. Easily clone containers so you don't have to start from scratch with each new container. Position modules in any way imaginable with high (pixel) precision. 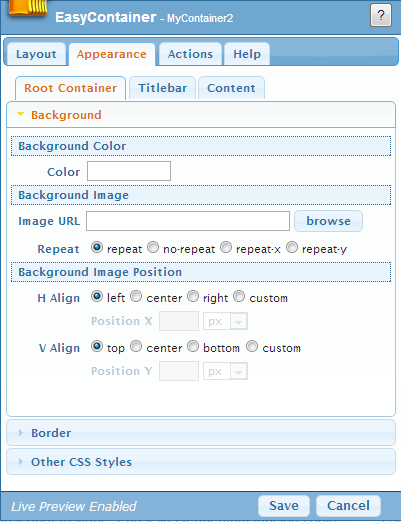 Any custom styles defined through the builder or directly in the CSS files are preserved by Easy Container. Define background and border around the whole container. Easy Container provides a checkbox to hide the toolbar when not needed. 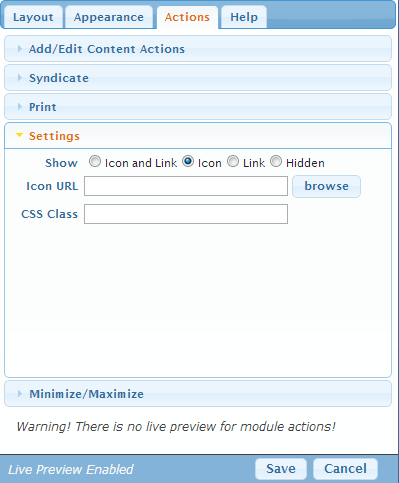 Select which module actions are available and define whether they're displayed with link, icon or both. 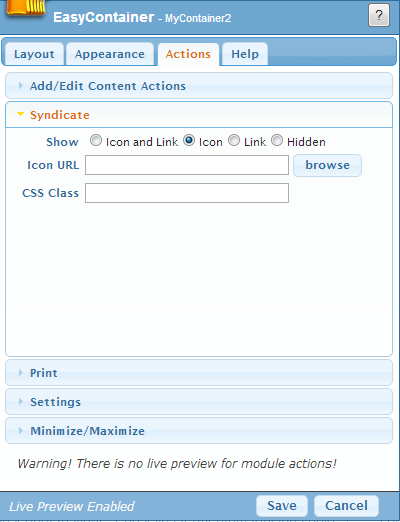 Configurable actions are Add/Edit Content, Syndicate, Print and Settings. 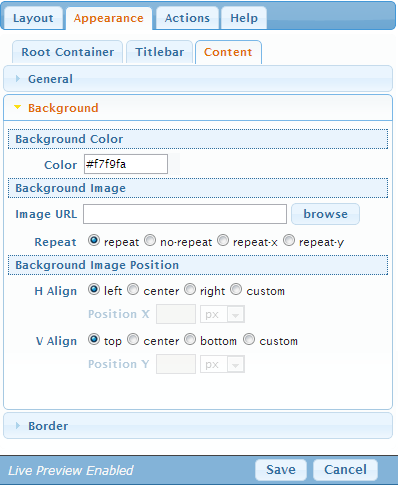 Configure if the container should have plus/minus buttons that determine the visibility of the content. 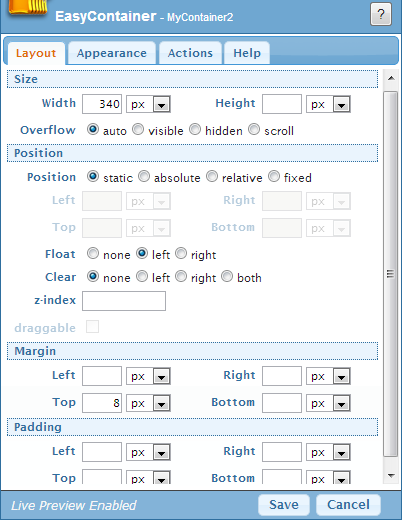 Configure icons, position and margin. There's a button on each Easy Container popup that when clicked highlights on the page which modules use current container. All containers are saved in standard DNN container folders, making it extremely easy to deploy or backup using file copy. Easy Container allows you to add powerful server side conditions which makes it possible to programatically decide which module is displayed. If MyTokens is installed, Easy Container will call it to replace tokens in server side conditions. 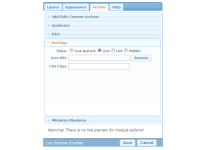 Action Form is the most powerful yet easy to use custom form builder available for DNN. It's responsive, too! Action Grid enables the integration of powerful tables from multiple sources into DNN projects, providing a simple yet flexible means of displaying data in a tabular format. DNN API Endpoint gives you a complete API platform for directly accessing DNN data securely and efficiently from outside your DNN portal. 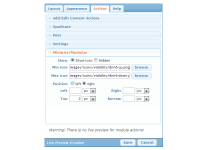 Use Fast Shot to bring your DNN portal to life with simple slideshows and galleries! InfoBox creates digital walkthroughs on your DNN portal improving the user experience and providing personalized guidance. Optimize your DNN portal to save you a lot of time performing mundane time-consuming DNN tasks that would have otherwise been done by you or your team. The more you can set on autopilot the better. Drastically improve your website loading time. Drastically improve your website's loading time with Sharp CDN. Sharp Look is not just a DNN theme, it is a powerful DNN theme framework, a total design suite with infinite customization possibilities. After your purchase and download the modules from the store you will receive your license key via email. Curious about our successful 10-year story? Well, it all starts with the adventurous spirit of Bogdan Litescu, who was working in different corporations at the time. But something just didn’t feel right for him. His desire to innovate and own something great, something which could help people, drove him to leave his job behind and start building his dream. He wanted to be surrounded by “artist” developers (in his words). Although it didn’t all turn out perfect from the first try, there was the freedom to try out new ideas and respond to the customers’ needs in a new, customized way. Bogdan’s strongest motivation was his refusal to accept defeat and so he kept trying, despite the uncertainty of every decision. The first product was launched on the 6th of February and the first license was sold within 10 minutes. Quite an encouraging start, right? But it’s not all stars and rainbows. The beginning also implied cut expenses, no vacation. In time, other developers appreciated Bogdan’s work and joined him. And so, The DNN Jedis started gathering. Together, they doubled the business every year, so, today, we are number 1 vendor in our market. Wonder how was that possible? Well, we owe every success to team work. While some of us handle the front-end, others are in charge with the back-end, support or QA. Whenever a task comes along, we communicate to find the best solution, then a few people start working on it and in the end all the team gives feedback. You think that is amazing? What if I told you that most of our customers are developers who understand and appreciate our work? We don’t just ease their work very much, we are rock stars. Let’s say our motto is “keep experimenting, keep innovating, keep growing together”. One secret ingredient of our recipe is communicating with our customers, in order to make sure we deliver the best services and adapt to the evolution of the market. If you want to go beyond “to be continued…”, follow us on our blog, Facebook, Youtube or Twitter. Oh, and one more thing, promise to keep our successful recipe secret?